If you want to be a successful gamer, the first and foremost thing that you’d require is to be comfortable while playing for the long hours. It is impossible for you to play like your usual selves if you have been on an old freaking folding chair for the past 6 hours. And thus, it will be only wise to invest in a gaming chair that is specially made to help you meet the required comfort level while playing or programming. You can think of the number of hours and days that you’ll be spending on this chair. If there’s an ergonomic chair to comfort you all this time, the result would clearly be evident from the increased productivity. 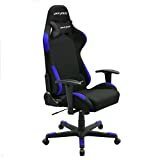 DXRacer is one such brand that manufactures gaming chairs, high in both, standards and price; but, there stands no competition to the level of refinement these chairs are built with. It can heighten your gaming experience manifold, and be your perfect partner even while working in the office or watching a movie at home. Why Choose DXRacer Gaming Chairs? These chairs have a higher than usual backrest to support your entire spine. For added support, a headrest cushion and a lumbar cushion are included with every chair. The metal star base is height-adjustable to suit the varying heights of your office desk or gaming desk. The back can be lowered down to full one-hundred-and-seventy degrees, and set to that position using the standard lock function. All the chairs are soft and padded, and the brand takes care of every aspect of the chair that a customer may think of. We’ll now present a detailed DXRacer gaming chair review, which would hopefully help you when you buy your next chair. The packaging is done really well to ensure that there’s no damage during transit. It comes in a really huge box, and the main parts include base, wheels, column, seat and back. Everything inside the box comes neatly packed in a foam. The box includes the headrest and the lumbar cushion too. One would normally expect a set of complicated instructions to compile the chair, but in actual, these are far easier than would expect. Most of the parts come preassembled and all you’ll have to do it to screw in at 10 places with the crew-driver that comes with it and click in the wheels. So, it is just a matter of 5 minutes, and you have your chair ready! DXRacer uses a lot of metal in the chair, a few plastic parts are there as well, but they too are sturdy as hell. On shaking the chair, you’d know that there’s no child’s play going on – the chair is sturdy enough, and nothing wiggles. It would make you feel secure. Even after you tilt the backrest to complete 170 degrees, you won’t have to worry about it breaking off. The chair offers adjustable arm rests, which make the complete experience more worthwhile. You can use these armrests while writing or gaming, and you can simply move these down if you don’t require them. If you have something important to do on your computer, you can do your work while sitting straight, but if you are just chilling out and want to lean down on it, simply flip the lever under the chair. There’s a rocking feature, which can be locked/unlocked and the resistance can be set too. You’ll never feel that it is becoming unstable and you can rock easily. This is the USP of DXRacer gaming chairs, one is guaranteed to fall in love with the comfort they offer. The leather-like material feels nice. The cushions are soft to rest on and the space offered is enough for you to move around a bit without feeling squeezed. As already mentioned, the pillows add to the overall comfort. The several models offered by DXRacer cannot be compared amongst themselves, they are all the same and excellent. The only difference that lies in these chairs is that they are all designed for specific body types. If you are on the heavier side, the best option would be to go for R or D series; if you are tall or wide, go for the M of King series. This way, the series and the model that is the best for you would depend on the shape, body measurements and your personal preferences. This chair looks amazing, I really could use a great gaming chair, mine is falling apart. This chair looks astounding, I truly could utilize an incredible gaming seat, mine is going into disrepair.